The flavors of Autumn combine to create this delicious soup packed with protein. For great flavors in your stew, simmer all ingredients on low for up to two hours. Cook bacon in stockpot over medium heat until crisp; remove with slotted spoon to paper-towel-lined plate. Brown 1/2 of beef in bacon drippings over medium heat; remove from stockpot. Repeat with remaining beef; season with salt and pepper. Return beef and bacon to stockpot. Add soup and cider; bring to a boil. Reduce heat; cover tightly and simmer 1-3/4 hours. Add sweet potatoes and cranberries to stockpot; bring to a boil. Reduce heat; continue simmering, covered, 20 to 30 minutes or until beef and potatoes are fork-tender. 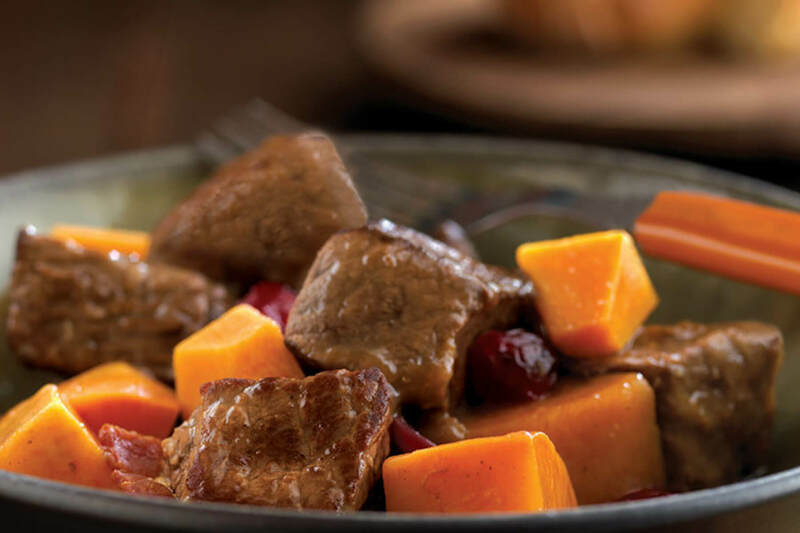 Robust beef flavor, moist and extremely tender when braised for pot roast. May also be roasted in oven and sliced thin.